Free download Halo: Hell on Earth Trilogy PC game. It is a first person shooting game; it is also an adventure and full of action game and developed by Dobermansoftware. 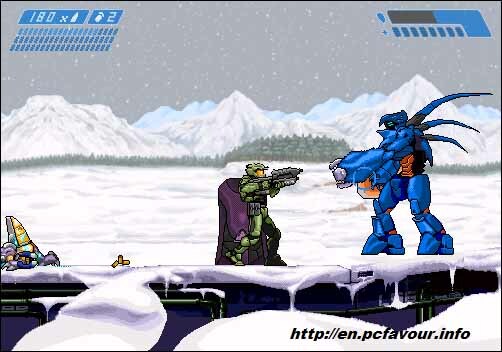 It has a lot of fun and fight, if you are lover of Halo series then you’d love this release too. It is 2D game basically, but still has a lot of attraction in it. Halo: Hell on Earth trilogy has a lot of levels to play, has a lot of enemies and foes and a large number of weapons. As it is a 2D game, hence there is less fear factor as compare to original one, still is gives you a lot of chances and challenges to fulfill it. The most important thing is; this is totally free and full version game to enjoy. This game will take you in 2552. The Aliens have attacked the earth and you are the los hope of humanity to save them. You have to kill them all as they will come in your way. They are more powerful than you. You must take care of yourself to defeat them and use proper weapons for different type of enemies. Each level is more difficult than the last one. You have to complete all the levels to win and unlock the Plasma Sword and use this sword to kill the Elite one. There are many releases of Halo game due to its popularity. You have to download this executable file, run this file and install it by just some clicks. This game is very light and quickly installable. After installation the shortcut icon will be named as ‘game.exe’. Just double click on this and enjoy the game. When you run the exe file then you’ll have the game interface. Before play the game you have to set the game controls. For this purpose, go to options. You can also set the color and background score too. Set the buttons to fire jump and fight with enemies.